Two years ago, my friend Daniela and I decided to head into San Francisco on the Saturday before Christmas to play tourists. It was so much fun we decided to do it again this year. So on the Saturday before Christmas, we took BART to the city, got off at Powell Street and headed up to Union Square to see the lights and last-minute shoppers. Then we headed up to Grace Cathedral via the cable car. So far, all was a replay of last year’s trip, except for one thing – in my bag I had Daniela’s Christmas present: a set of red, black and gold glass prayer beads I made especially for her. 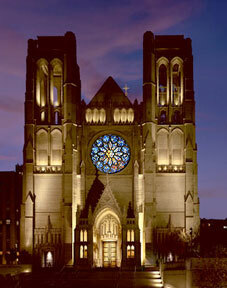 I planned to give them to her inside Grace Cathedral and show her how to use them as we sat in its hushed light. As she unwrapped, I explained that this was not a piece of jewelry, but a set of prayer beads I had made for her with her needs (as I understood them) in mind. I said I had chosen to make them red not just because it is her favorite color, but it also seems to be the color she surrounds herself with. It is a color that seems to represent, for her, her idea of herself. I made them using the Episcopal rosary format not because she is Episcopalian (she isn’t) or even Christian (she isn’t) but because it seemed the most manageable for her.I explained that she could pray anything on them that she wanted to and to any being she wanted to. Daniela is a very spiritual person, but her spirituality is very different from mine. I would describe her as more New Age than I am and with a good dose of woman-centered paganism thrown in. She has many times mentioned to me that she feels connection to goddesses and spirit guides and she has a deep reverence for the divine feminine. She does not pray in a way I would pray, but “puts out” energy and ideas and thoughts. So for her prayer beads a cross or other specifically religious icon would not have been right, so I used a red crystal heart for a terminal charm. I had intended to use a goddess charm, but that did not seem right. I think it is because more than being guided by “the goddess,” as I understand the idea, she is guided by a belief that the universe is a positive place full of love and intuition and an overaching goodness. A heart, it seemed, captured that better than a goddess. Daniela loved them. She was very moved and started to tear up. And I was deeply pleased that I had been able to give her something that I hoped would honor her spirit and her soul and not just a holiday requirement for giving a present. I then suggested that we walk the labyrinth together. Since this would be her first time using prayer beads and maybe her first time walking a labyrinth, I suggested that rather than trying to come up with prayers for the beads, she hold onto them and keep in her mind an idea of what she hoped for as she she walked. I said she could think of this as dedicating the beads to a certain purpose – perhaps bringing goodness and love into her life, or a renewed sense of purpose, or whatever she felt a need to speak to the universe about. I had also brought a set of prayer beads (I have a set for almost every bag and pocket I own!) and took mine out. Because I knew we would go to Grace and I hoped we would walk the labyrinth, I had brought a set of Episcopal prayer beads made of natural colored stone (like the labyrinth) and with a pewter labyrinth as a terminal charm. It was very cold as we walked there in the shadow of Grace Cathedral. I held my prayer beads in my gloved hands in front of me and began an invocation of the Trinity – In the name of the Father, the Son and the Holy Spirit . . .” as I took my first step in. Daniela waited a minute or so and then entered behind me. I moved on to the Lord’s Prayer on the invitatory bead and then on to a favorite Psalm verse for the cruciforms and the prayer of Julian of Norwich (“And all shall be well . . .”) for the weeks beads. I found that as I walked my whole being seemed to slow down to the tempo my feet and my fingers were keeping. I could focus on every syllable, every step. I also became very attuned to the sounds about me – car horns, feet on stone steps, people chatting as they passed by, the roar of a bus engine – but was not distracted by them. Rather, it was as if I became intensely focused on what was here and what was now – me, the prayers and the world. After we completed the labyrinth, we sat on the stone bench again and were very quiet. It was a lovely, still moment in the midst of an otherwise busy and bustling day and a sea of serenity in an otherwise overwhelming time of year.